Ideal for small offices and home-based agents in telephone intensive situations, this is a fully functioning single-line telephone with conveniently arranged controls. It is the best choice for anyone who spends a lot of time on the telephone - such as Phone sales, Telephone Counseling Services, Insurance, Hospitals, Banks, Telecom operators, Enterprises- and who wants to take up minimum desk space for a telephone/headset system. Fully functioning monaural headphone with exquisite buttons for superior communication experience. The headset clip can be stretched freely and comfortable wear for all day use. An extension jack allows connection to a second phone or modem; Recording jack connects to a recording device for call monitoring purposes; The handy headset hook keeps your desk area neat and organized. ♦ Easy to Setup -- Connects this telephone headsets to existing standard telephone jack Durable construction and rigid design for greater longevity. ♦ Noise Cancellation Microphone -- Equipped with noise canceling microphone, AGPtEK phone with headset can increase the voice clarity for superior high quality sound and screen 90% background noise so as to perfectly and truly present the sweet voice of the telephone operator. ♦ FSK/DTMF Caller ID Display -- The dialer can ring or silent when receive incoming calls as well the phone number will be displayed. Everything included of this call center phone and headset; So you can just plug into the wall telephone port and you are ready to make and receive phone calls. ♦ Volume Adjustment -- Scrolling wheel volume button of the corded phones can make the control of the sound easily and allows a more flexible listening experience. 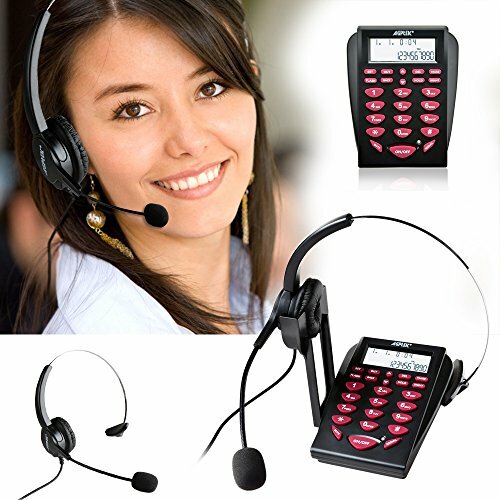 ♦ 30 DAYS RETURN -- If you are unsatisfied with the headset telephone, simply return it within 30 days for a full refund.